"Black bass" redirects here. For other uses, see The Black Bass (disambiguation). Micropterus is a genus of freshwater fish in the sunfish family (family Centrarchidae) of order Perciformes. The species of this genus are known as the black bass. The black bass are sometimes erroneously called black trout, but the name trout more correctly refers to certain members of the salmon family. The black bass are distributed throughout a large area east of the Rocky Mountains in North America, from the Hudson Bay basin in Canada to northeastern Mexico. 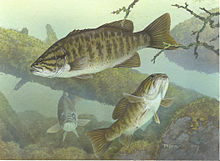 Several species, notably the largemouth and smallmouth basses, have been very widely introduced throughout the world, and are now considered cosmopolitan. Black bass of all species are highly sought-after game fish, and bass fishing is an extremely popular sport throughout the bass's native range. These fish are well known as strong fighters, and their meat is eaten, being quite edible and firm. All Micropterus species have a dull-green base coloring with dark patterns on the sides. Most reach a maximum overall length of 40–60 cm (16–24 in), but some strains of the largemouth bass have been reported to grow to almost a full meter (just over three feet) in length. The male builds a "bed" (nest) in which a female is induced to deposit her eggs and then fertilizes them. The male continues to guard the eggs and fry until they disperse from the nest. Various species have been introduced into freshwater bodies in Japan, where they have been declared nuisance fish, and subjected to numerous attempts at eradicating them from local ecosystems. ^ Rohde, F.C., Arndt, R.G., Lindquist, D.G. & Parnell, J.F. (1996): Freshwater Fishes of the Carolinas, Virginia, Maryland, and Delaware. Chapel Hill: University of North Carolina Press, 1994. ^ "Locals in for long haul in battle against non-native fish". Asahi Shimbun. 6 July 2007. Archived from the original on 29 September 2007. Retrieved 12 June 2014. ^ a b c d Baker, W.H., Blanton, R.E. & Johnston, C.E. (2013): Diversity within the Redeye Bass, Micropterus coosae (Perciformes: Centrarchidae) species group, with descriptions of four new species. Zootaxa, 3635 (4): 379–401. ^ Tringali, M.D., Barthel, B., Seyoum, S., & Knight, J. (2013): Molecular and Morphological Evidence for a Novel Black bass Species Native to Rivers of the East Gulf Coastal Plain . Proceedings of the Symposium Black Bass Diversity: Multidisciplinary Science for Conservation, Nashville, American Fisheries Society 143rd Annual Meeting. This page was last edited on 27 November 2018, at 15:38 (UTC).